Wolfgang Gentzsch, adjunct professor of computer science at Duke University in Durham, and visiting scientist at RENCI Renaissance Computing Institute at UNC Chapel Hill, is currently presenting a key note at the 4th International Conference on e-Social Science. Focusing on Grid Computing of note is his view that the Grid is currently in the ‘trough of disillusionment’ in terms of the Gartner’s Hype Cycle. “Technology Trigger” — The first phase of a hype cycle is the “technology trigger” or breakthrough, product launch or other event that generates significant press and interest. “Peak of Inflated Expectations” — In the next phase, a frenzy of publicity typically generates over-enthusiasm and unrealistic expectations. There may be some successful applications of a technology, but there are typically more failures. 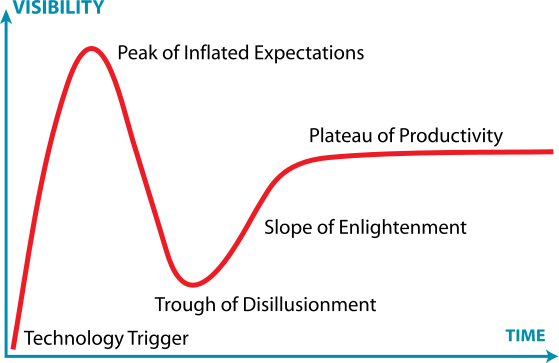 “Trough of Disillusionment” — Technologies enter the “trough of disillusionment” because they fail to meet expectations and quickly become unfashionable. Consequently, the press usually abandons the topic and the technology. “Slope of Enlightenment” — Although the press may have stopped covering the technology, some businesses continue through the “slope of enlightenment” and experiment to understand the benefits and practical application of the technology. In terms of e-Social Science the Grid is yet to deliver compared to the hype, personally at CASA we have moved away from Grid based services, time will tell if the Grid can reach a Plateau of Productivity? Should Laptops be Banned in Conferences?